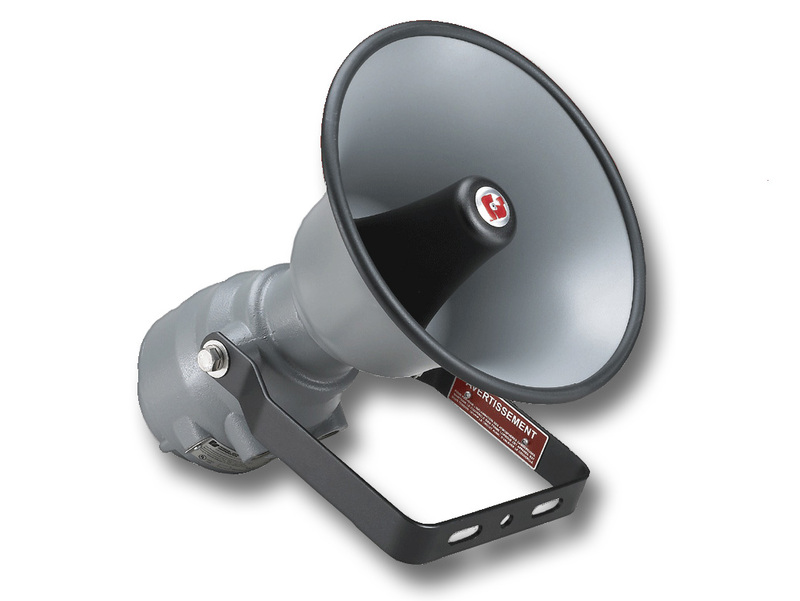 Federal Signal’s Model 300X SelecTone® Amplified Speaker is designed to meet UL 1480 intelligibility requirements producing crisp, clear tones, digital voice messages and live public address in harsh environments with high ambient noise levels. All surfaces are sealed with powder-coat paint and assembled with stainless steel hardware. Dust- and moisture-proof gaskets provide protection from the elements. This housing incorporates a tool-less rear cover design, eliminating the need for torque specific hardware and solves the problem of missing or lost fasteners. For plant-wide signaling, a Connector Kit is required for each SelecTone Amplified Speaker and wired to a central controller. SelecTone Command Units and CommCenter® Digital Message Centers broadcast tones, voice messages, melodies and live public address to an unlimited number of SelecTone Amplified Speakers. Applications for SelecTone include emergency warning, plant evacuation, start and dismissal, public address, and process control.